I love anything & everything made in crock-pots. I have yet to eat anything that didn’t taste incredible coming form a crock-pot. I use my crock-pot at least once a week if not more. Sunday’s I call crock-pot Sunday’s because i’m almost always whipping something up in that sucker. Yesterday was filled with ice & kid birthday parties. I was caught off guard with the weather and was unable to put anything together in the crock-pot before I started my day. My typical Sunday consists of me waking up, eating breakfast, enjoying a cup of coffee & browsing pinterest for a crock-pot meal to make that day. Since it didn’t happen yesterday, crock-pot Sunday’s was moved to Monday for the week. My roommate, aka my dad, mentioned how he wanted a creamy tortellini soup with chorizo. 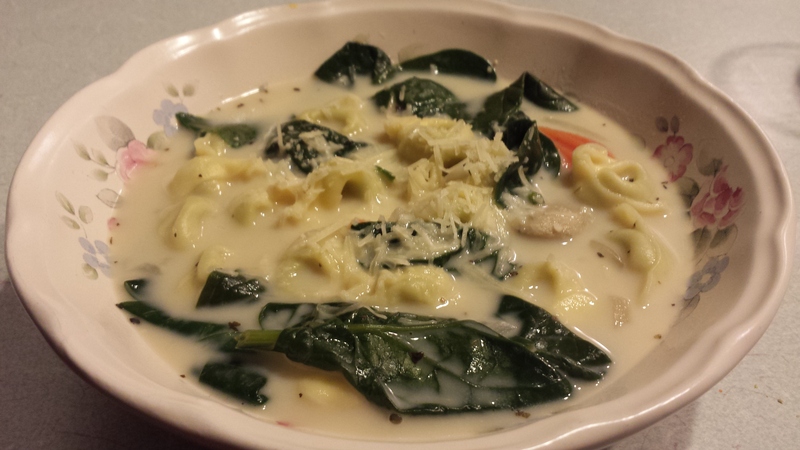 I’ve made this delicious Creamy Tortellini Soup from Better Homes & Gardens on numerous occasions. It’s always been a hit. Tonight I decided to put a little different spin on it. Instead of chorizo as requested, I opted for a roasted garlic chicken sausage to add into the soup along with some carrots for some added texture. As with almost every crock-pot recipe, you basically throw the ingredients into the crock-pot & let it work its magic! It’s so great. This recipe is basically that. Throw almost all of the ingredients into the crock-pot, wait a couple of hours, throw the rest of the ingredients into the crock-pot for an additional 45 minutes & BAM, you have a delicious soup ready to devour. This soup is also excellent for the winter. The creaminess of this is perfect for a chilly winter night! In a large crock pot on the low/medium setting add water & envelope of white sauce. Whisk together until combined & smooth. Stir in the chicken broth, chopped onion, carrots, garlic, basil, salt, oregano, cayenne pepper & sliced chicken sausage. Once combined, cover & cook on low-heat for 5-6 hours or high heat 2.5-3 hours. Stir in dried tortellini, spinach & evaporated milk. Cover & cook on low setting for an additional 45-60 minutes or high for 30-45minutes, until tortellini is tender. Sprinkle each serving with a little parmesan cheese & enjoy!